- It is a stand-alone rock/earth pillar, about 6 meters high. 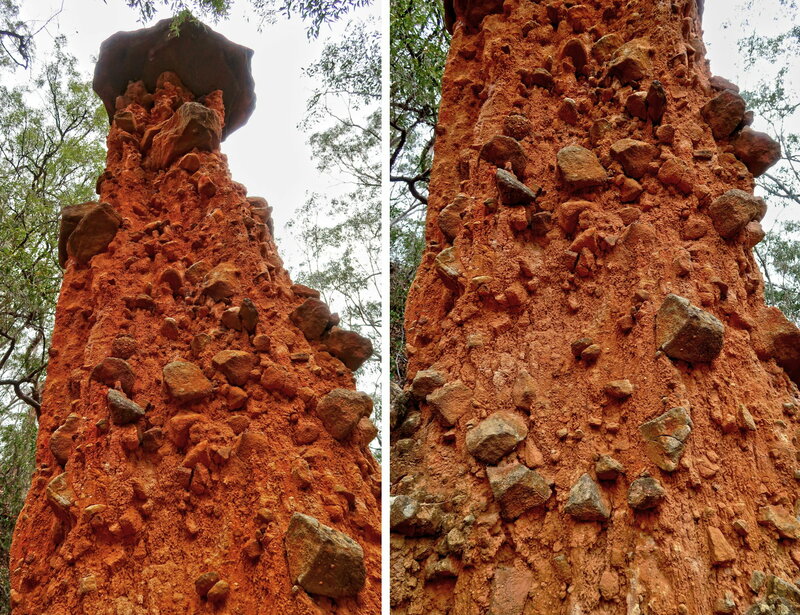 - Somehow, the pillar is made of material strongly bound together and resistant to weather erosion ... but how what why and when? It is also protected somewhat by a capstone on its top, but that doesn't explain its continued existence. - The capstone itself looks like a loose hat. Why hasn't it been blown away already ? - Standing on a steep slope, the Totem Pole is also gravity-defying. You really have to wonder why it hasn't toppled over already ! - Plus 3 ladies: Amy, Enna, Rita ... but they drop out early. Overall total: 50 km; 21 hrs ... ALL IN ONE DAY ! Is it worthwhile to walk 50 kilometers, 21 hours, just to see the Totem Pole ? If you have to ask the question, you wouldn't understand the answer ! - Our GPS tracklog is in red. - Newnes is at the left end of the tracklog. - Totem Pole is at the right end of the tracklog. - Scroll forward to see detailed sections of the map. 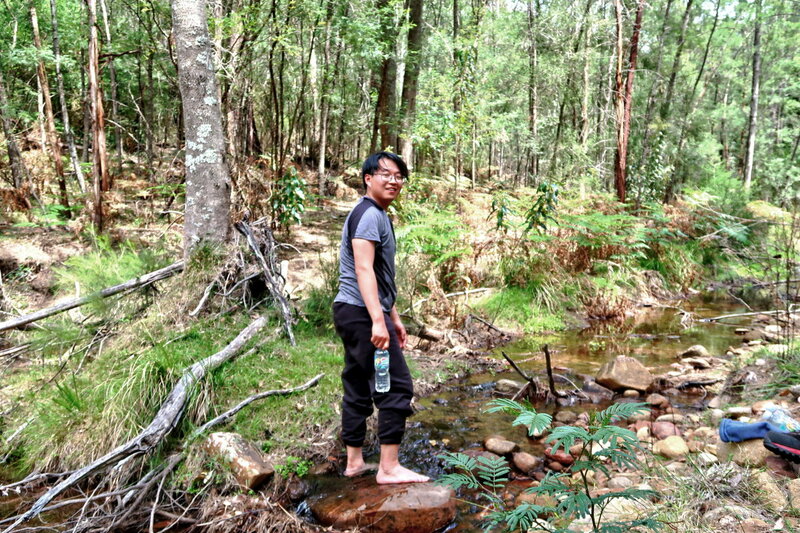 As you can see, the entire trip is a level-ish walk along the Wolgan River. 1. Small carpark at Newnes by the side of Wolgan Road. The ford is just to its right (east). 2. 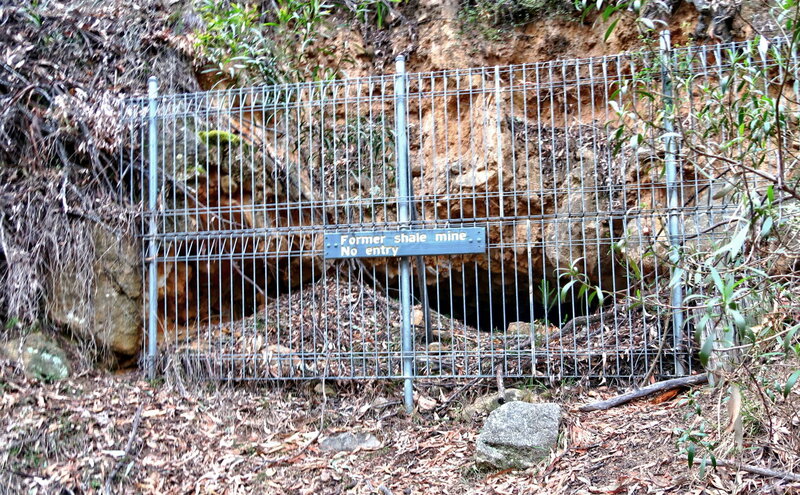 Locked gate on Newnes Ruins Road to prevent cars from going further east. 3. 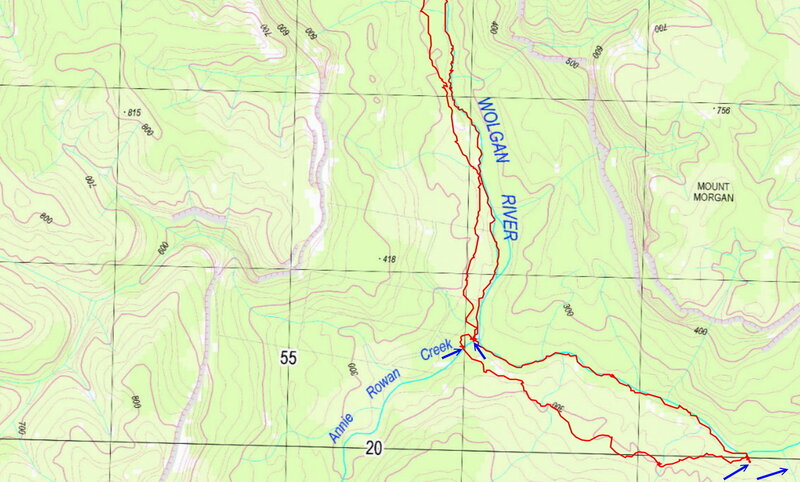 Wolgan Trail (black dotted line) doesn't exist past the east side of Rocky Creek. The map is wrong. 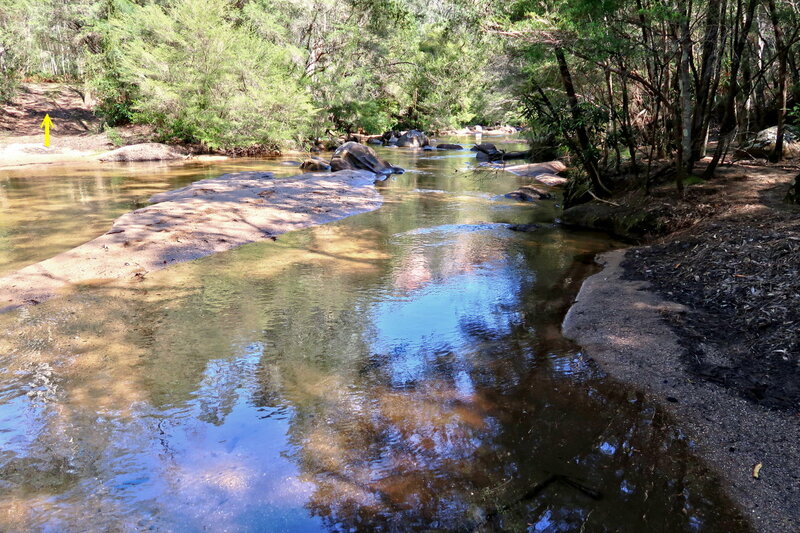 Our tracklog is on a firetrail which crosses Wolgan River at its confluence with Rocky Creek. 2. 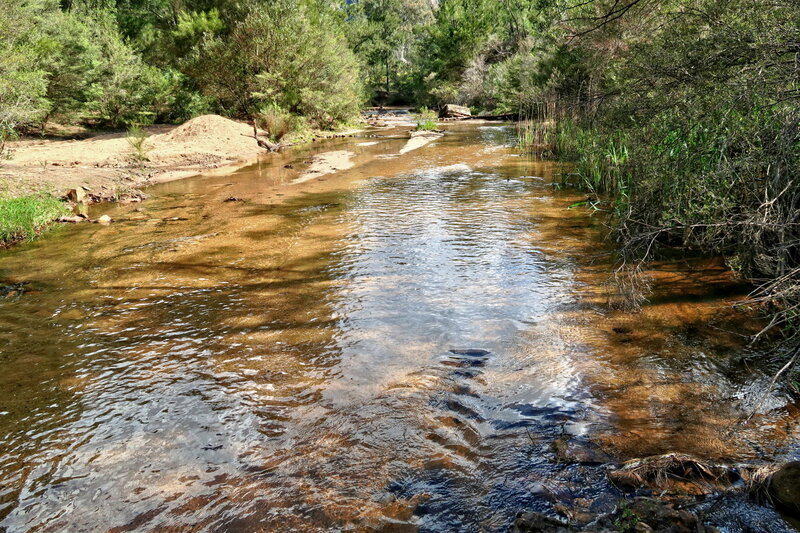 The firetrail re-crosses Wolgan River here. We won't cross the river. Instead we continue on an indistinct disused road/track on the north side of the river. - The one on the left is how we continue to the Totem Pole. 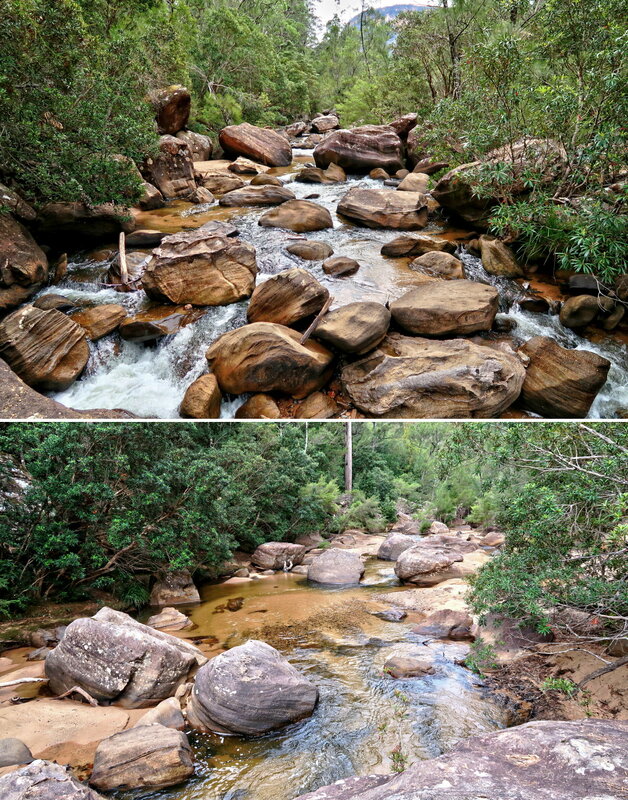 - The one on the right is our return route along the bank of Wolgan River. - Our route to the Totem Pole is the left tracklog. 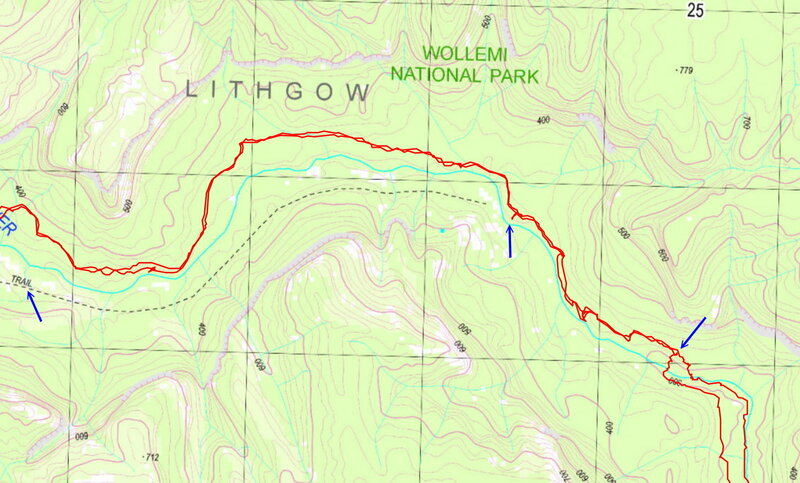 - The return route is along the Wolgan River - the right tracklog. 2. Afternoon tea by the side of Annie Rowan Creek on the return leg. 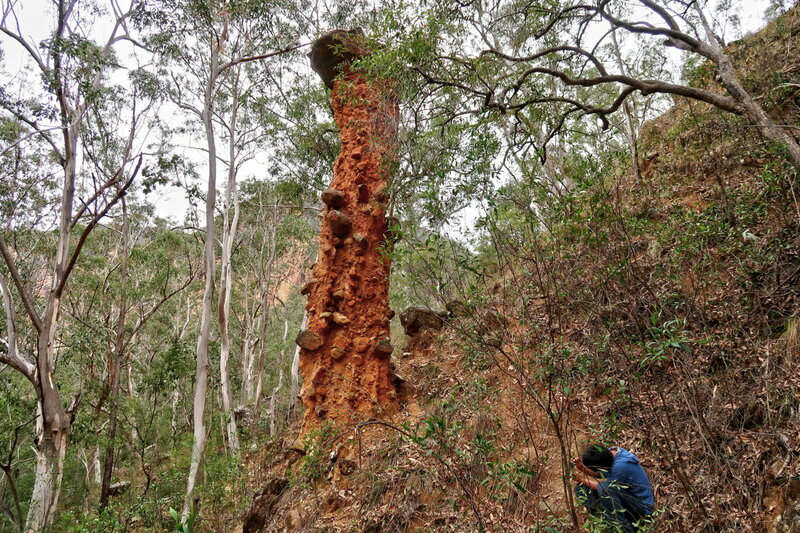 - From Totem Pole to where we need to cross to the north side of Wolgan River, we walk along the south bank of the river instead of bushbashing up slope away from the river. I took off my boots while crossing the river ... now put them back on. or stay on the north side and follow an indistinct disused road/track. 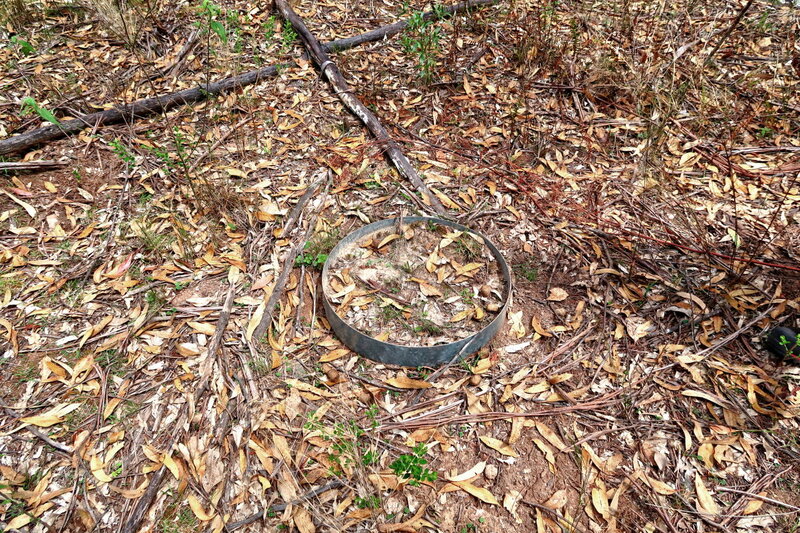 11:26 18.9 km Disused road/track peters out around here. We take a rest. 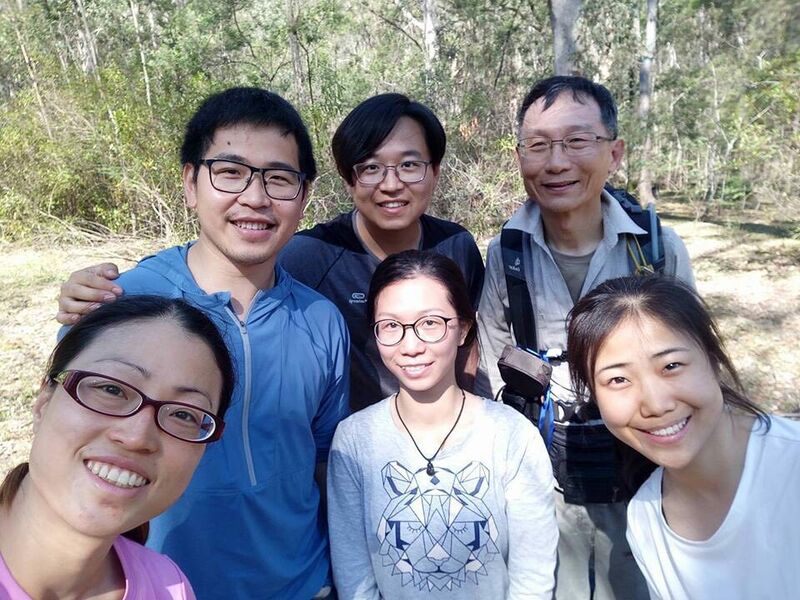 13:55 22.4 km Resume walking ... we walk higher up the slope, away from the river. So, the return leg is faster. 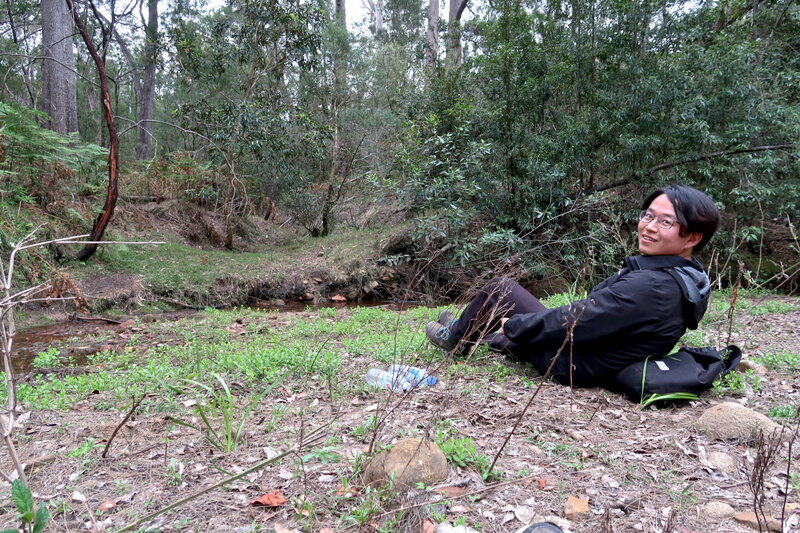 It is because we walked along the south bank of the Wolgan River (from the Totem Pole to here). By contrast, we walked higher up the slope on the way to the Totem Pole. So, the first leg is faster. It is because we walked higher up the slope from here to Annie Rowan Creek. By contrast, on the return leg, we walked along the river bank. This is where I sleep for the night ... in my car, the silverish/greenish car. - It is Friday night, the place is quite full. - The gap near the centre of the pic, between the 2 mountains, is towards east. Wolgan River flows through there; and we'll also be walking through there the next morning. Only the 3 guys reach the Totem Pole. The ladies drop out at Rocky Creek. We park our cars at the carpark. 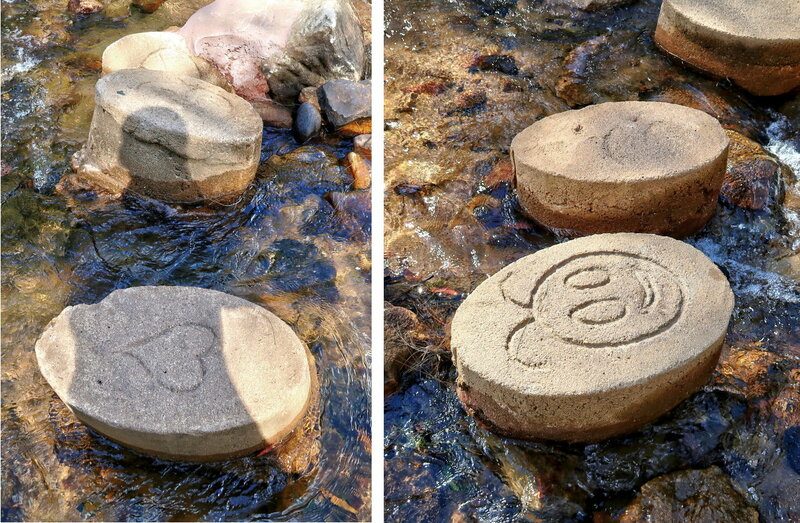 - There are stepping stones for walkers to cross the ford. If you have a high clearance 4-wheel-drive, you can drive through the access road to cross the ford. At the time of writing, the access road is badly corroded and rutted. After the ford, the access road meets up with Newnes Ruins Road. From this junction, we walk east-ish for 1.3 km to a locked gate. So, if we have a 4-wheel-drive, we could have driven all the way to the gate. 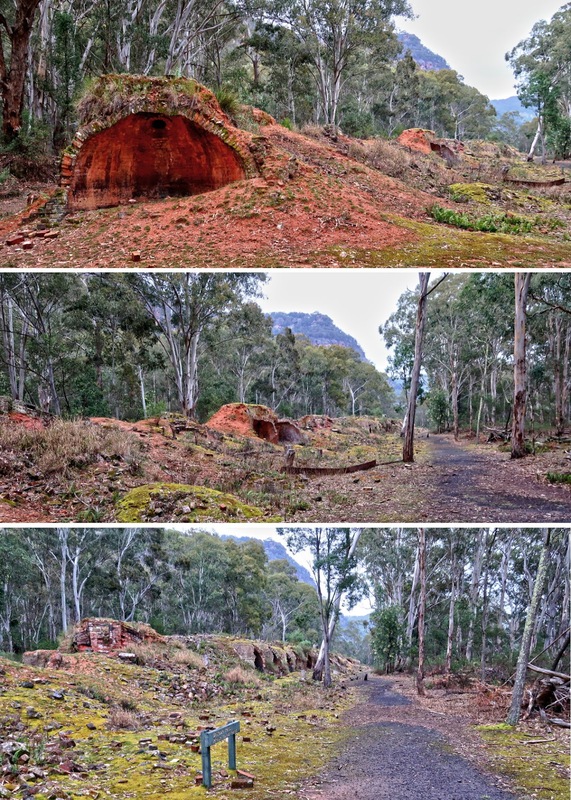 After the locked gate, the Newnes Ruins Road becomes a firetrail. On the map, it is called Ruins Walking Track. 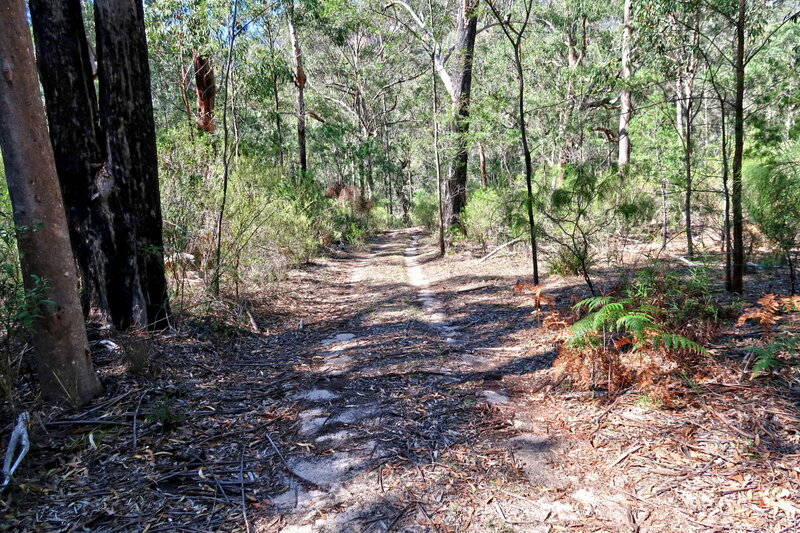 The Ruins Walking Track lasts for about 1 km, after which it is called Wolgan Trail. 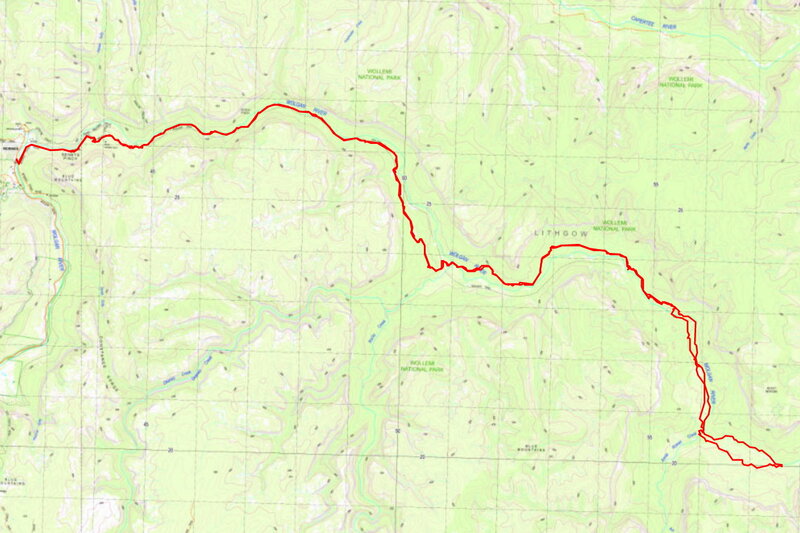 In this trip report, I'll call the road east of the locked gate simply as the firetrail. 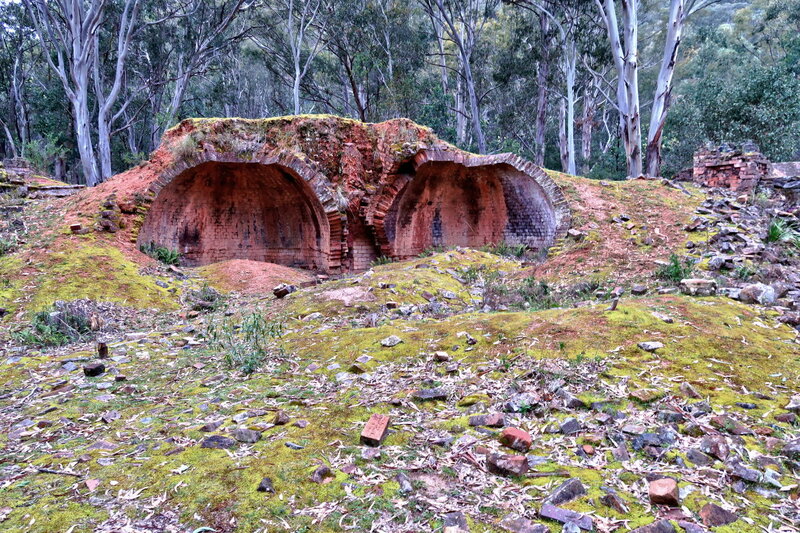 7) On the firetrail (Ruins Walking Track), we pass a line of coke ovens. 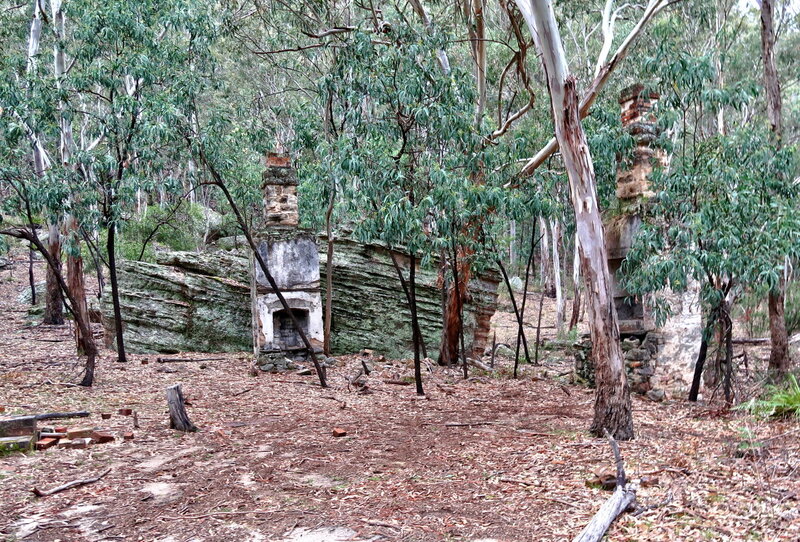 They are the ruins of Newnes shale oil processing works in the early days of Australian history. 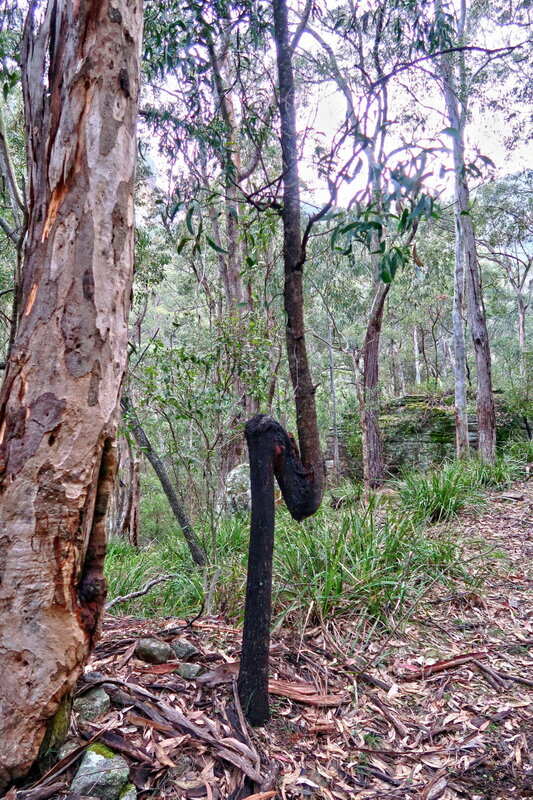 The firetrail after the locked gate goes along the south side of Wolgan River all the way to Rocky Creek and beyond. 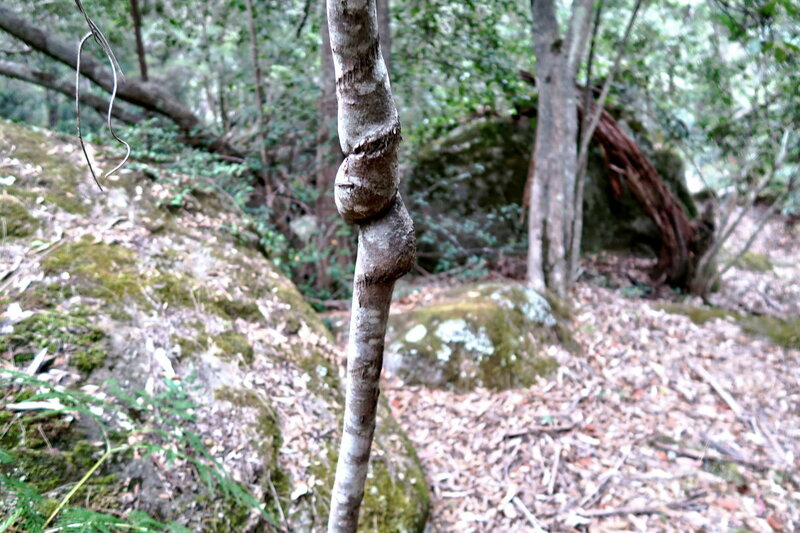 12) This tree trunk makes a Z bend. Despite its burnt out look, it is alive. 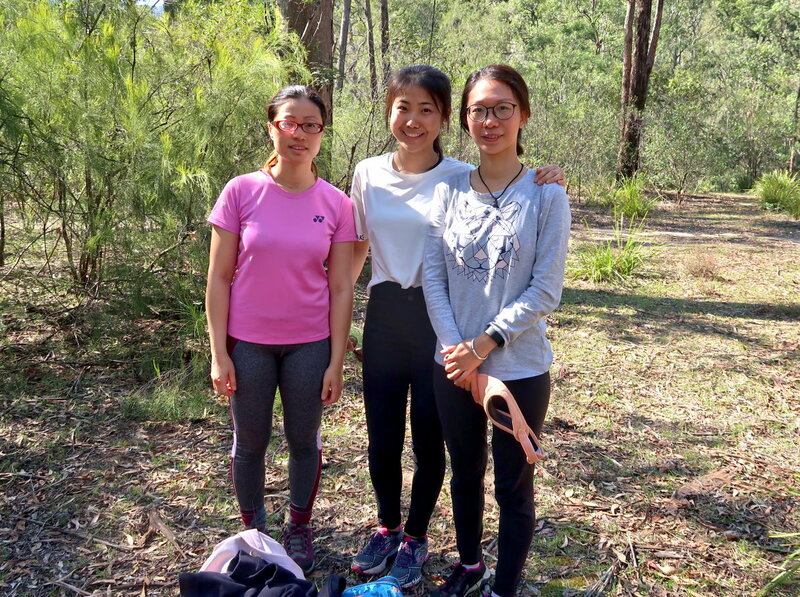 19) Rita, Amy and Enna decide to return to Newnes ... not a surprise, as the pace required for the 50-km one day trip is too gruelling for most people except the very fit and foolhardy too. That left the 3 of us, Neilson, Jimmy and I, to continue to Totem Pole. 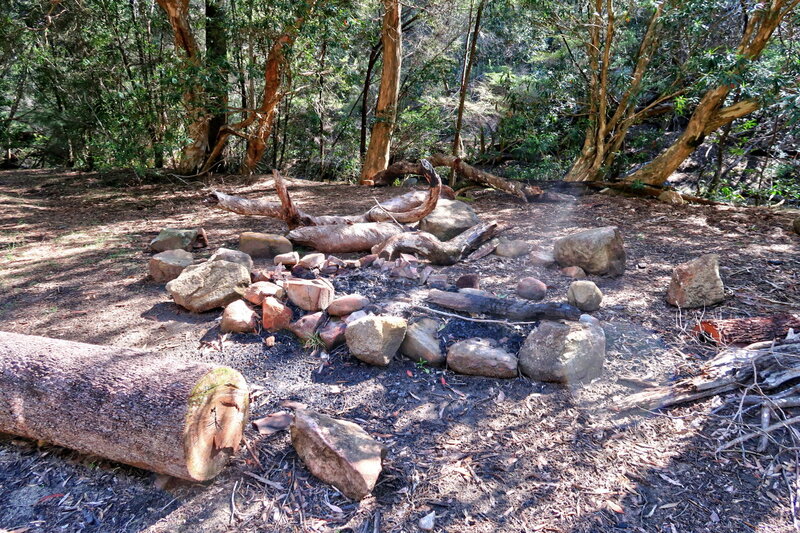 20) This good looking fire place is about 100 meters further down the firetrail from where the previous pic was taken. It would be a good camping site. And we are almost at the edge of Rocky Creek, but haven't crossed it yet. 22) We now cross Wolgan River from its south bank to its north bank. 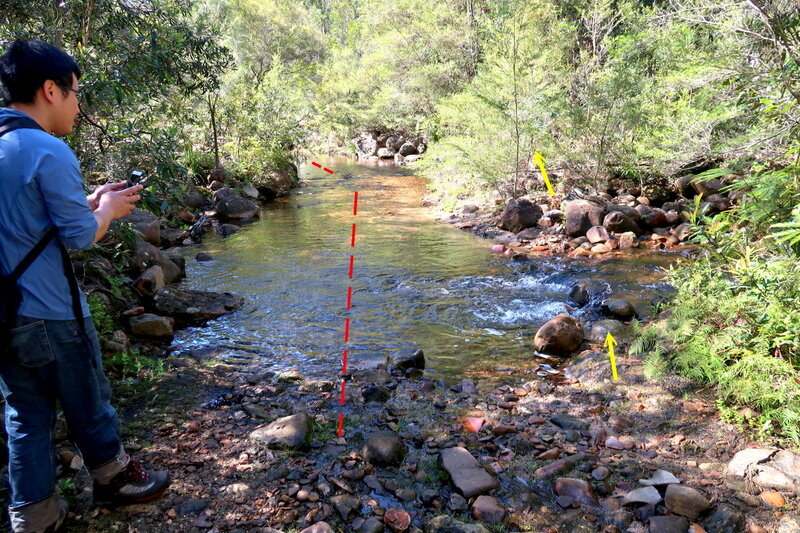 - Yellow arrow: The firetrail on the north side of Wolgan River ... We'll walk on there. - I take off my boots when crossing the river. - But on the return leg, I'll be too tired to bother about wet feet and will just walk into the water with boots on. Then continue along the wet creek bed of Rocky Creek ... see previous pic. 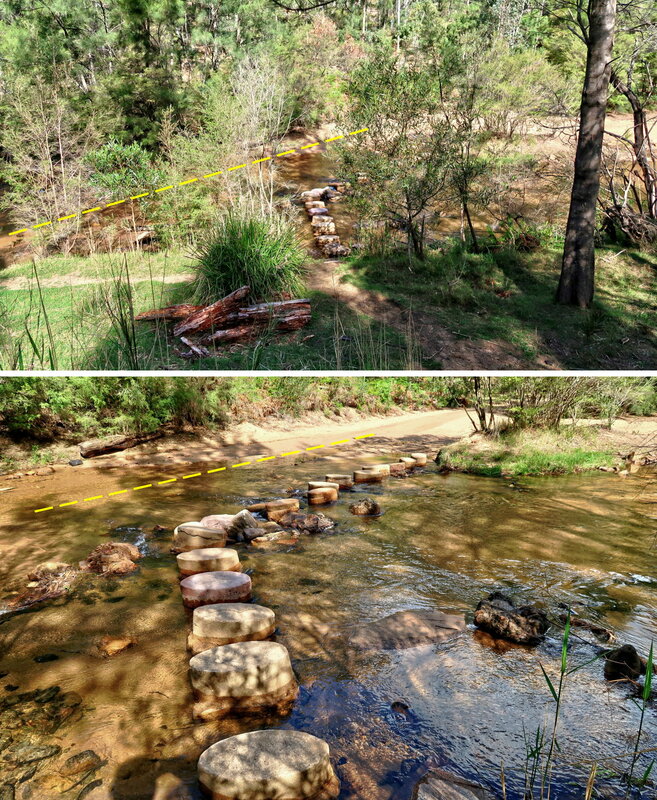 Water depth in both the Wolgan River crossing and along Rocky Creek is up to a bit above the knees. 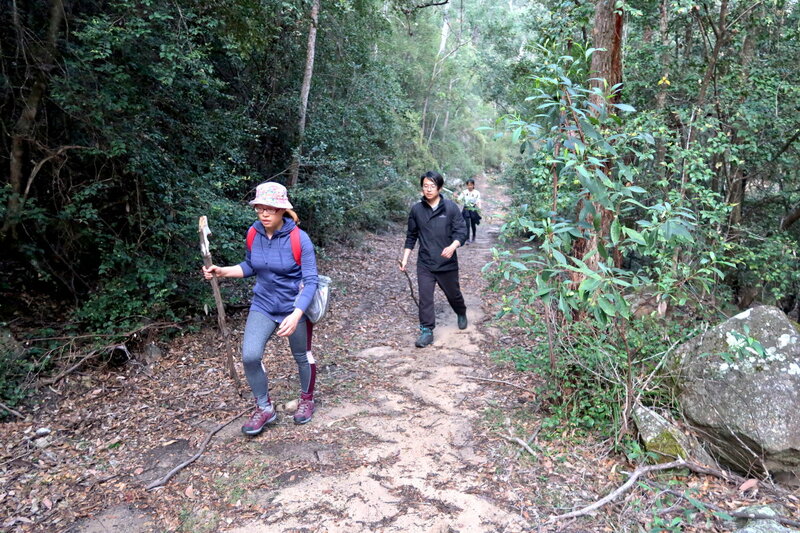 23) The firetrail is also in good condition on the north side of the Wolgan River. The firetrail goes on for 4.2 km. 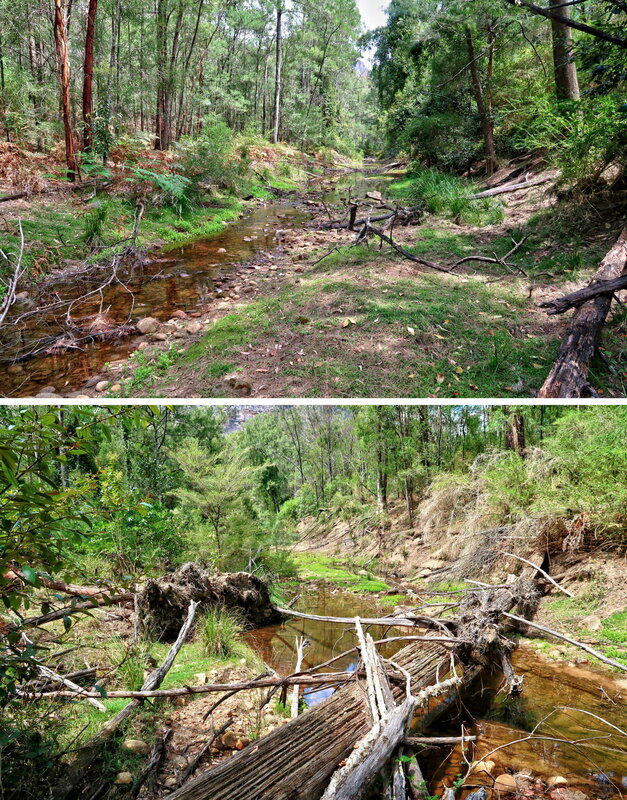 After which it will cross the Wolgan River again back to its south side. Then there maybe, or supposed to be, an indistinct(?) 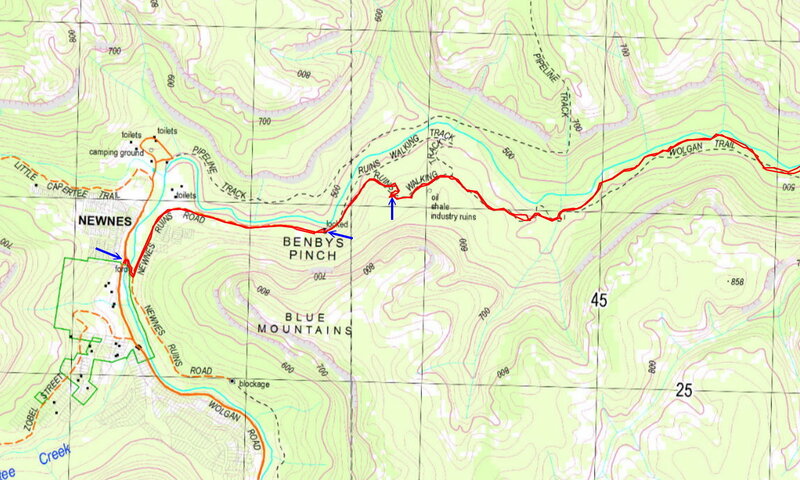 foot track all the way to Annie Rowan Creek. 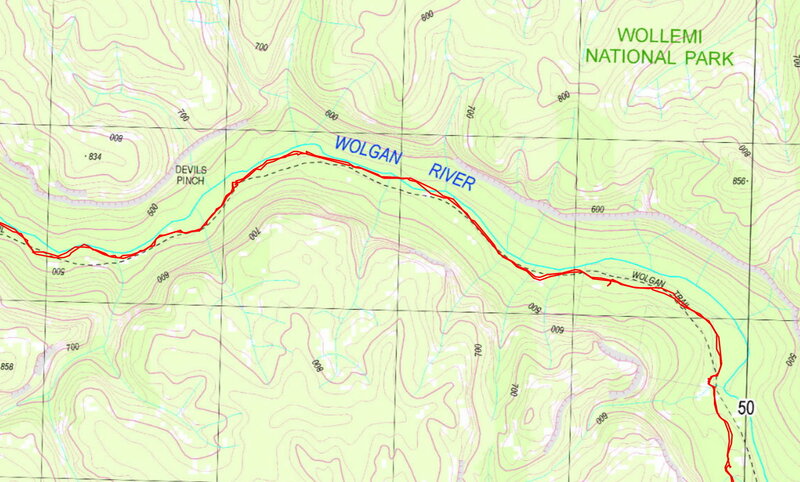 However, after 4.2 km, we won't cross the Wolgan. Instead, we keep on its north side and walk on an indistinct disused road/track. It peters out about 1.5 km later. 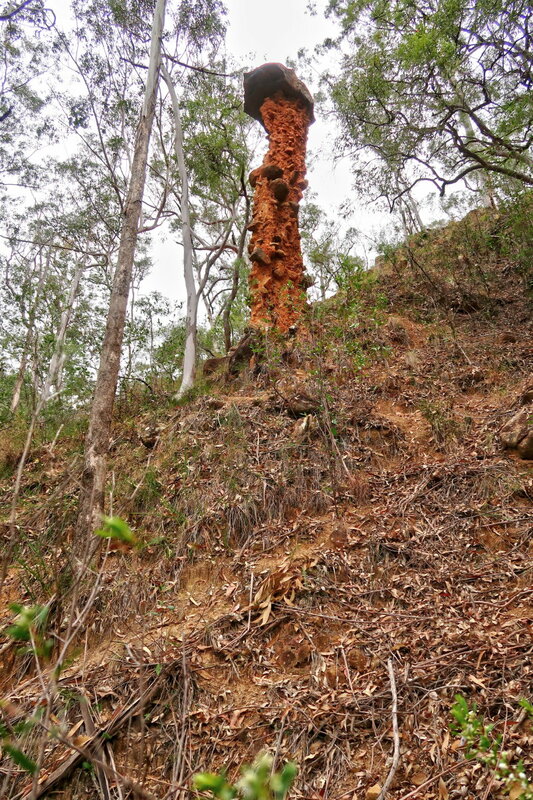 At that point we bushbash down a steep slope to the Wolgan River and cross to its south side. 24) On two separate occasions, we encounter two Lace Monitors, Varanus varius. 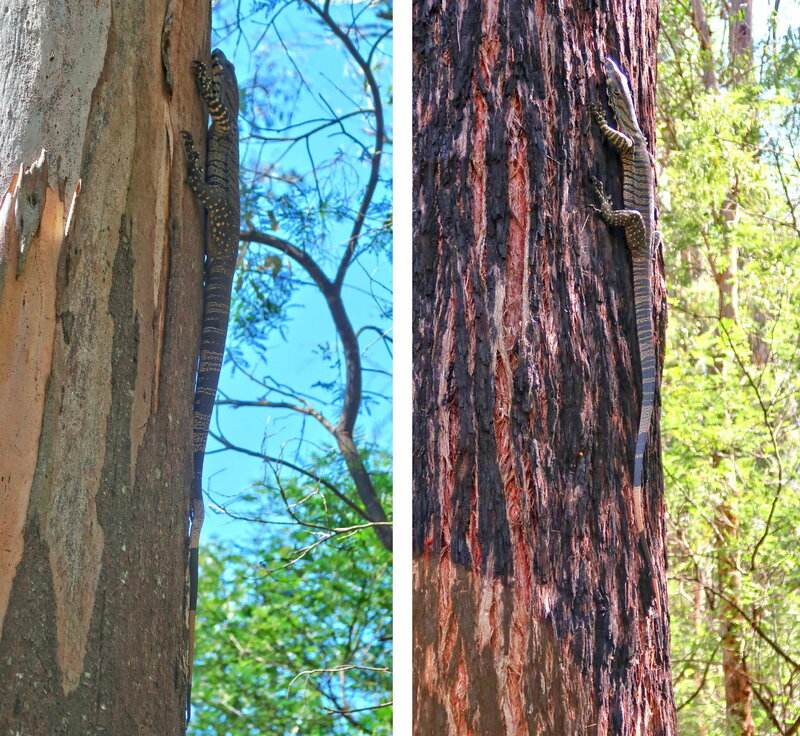 They were sun bathing along the firetrail, but quickly scamper up the trees when we approach them. What are they? Please let me know. 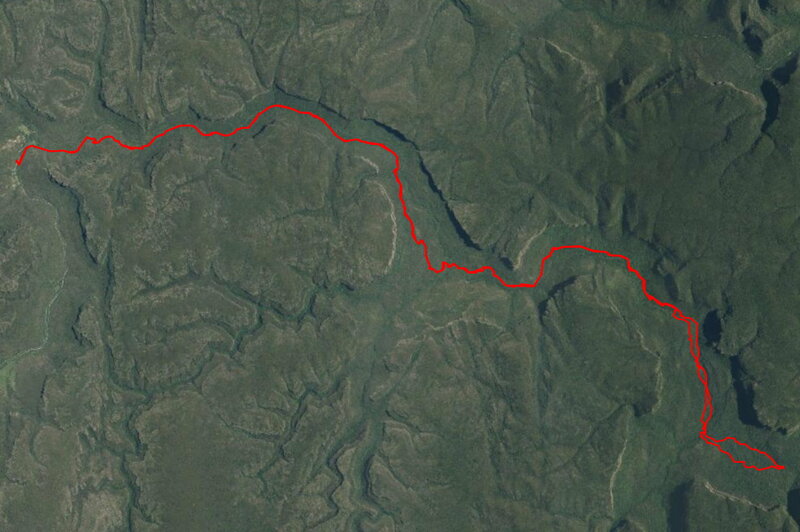 26) As mentioned earlier, the firetrail becomes an indistinct disused road/track which peters out 1.5 km later. 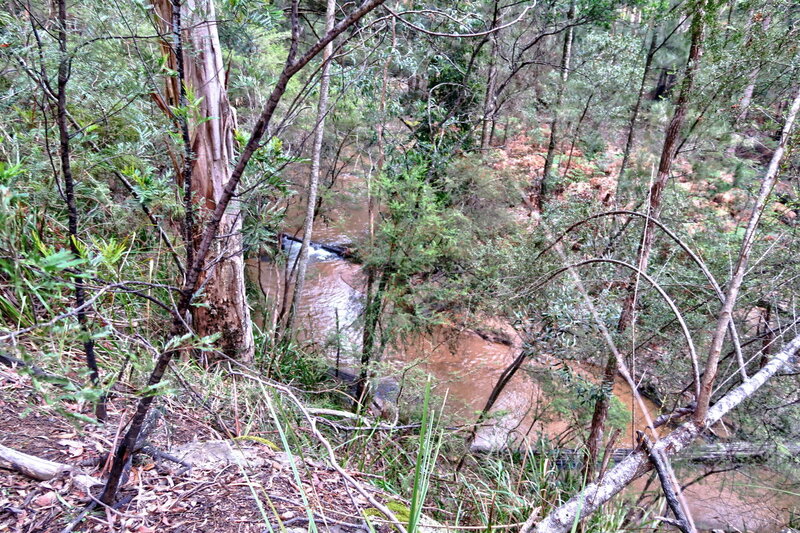 At that point, we bushbash down a steep slope and cross the Wolgan River ... here. 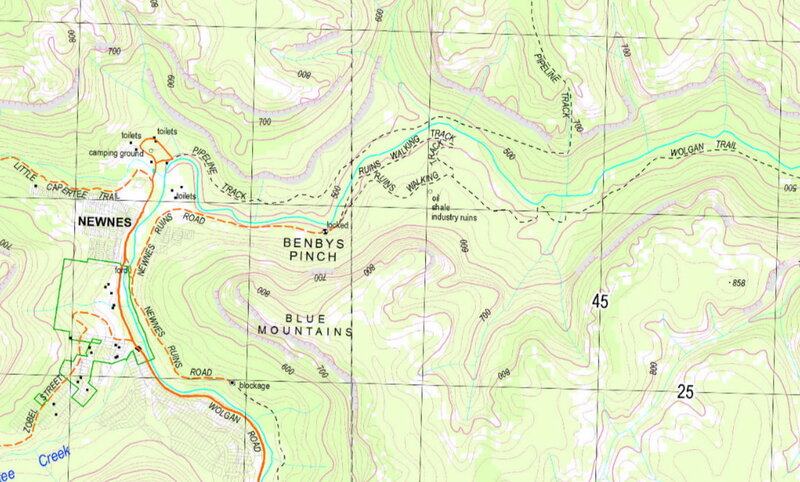 27) After crossing Wolgan River, it is bushbash to Annie Rowan Creek. The scrub is not too dense, but it is prickly with thorns. You are well advised to put on a pair of gloves. 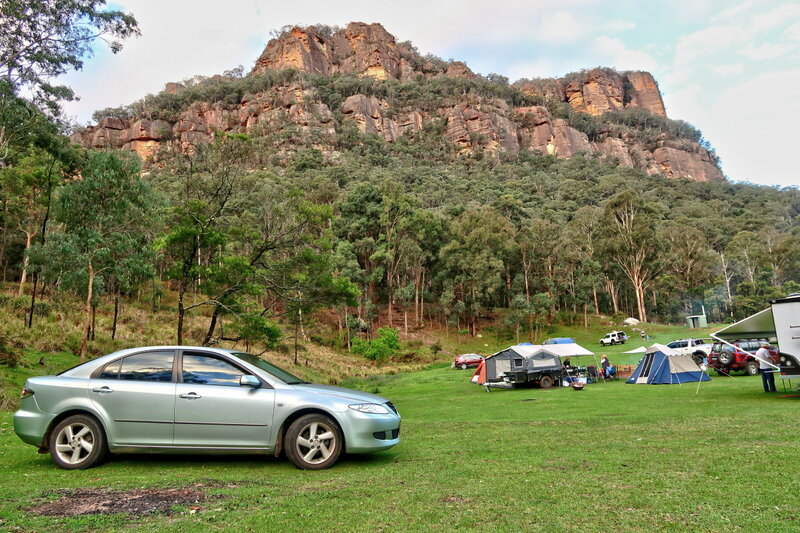 On average, we keep to about 100 meters from the bank of Wolgan River. We didn't notice any foot track. There maybe one, perhaps indistinct. And if so, it maybe further up the slope from the river ... just guessing. There is still 2.5 km to the Totem Pole. We have lunch here. And in the pic, Jimmy is filling up his water bottle. 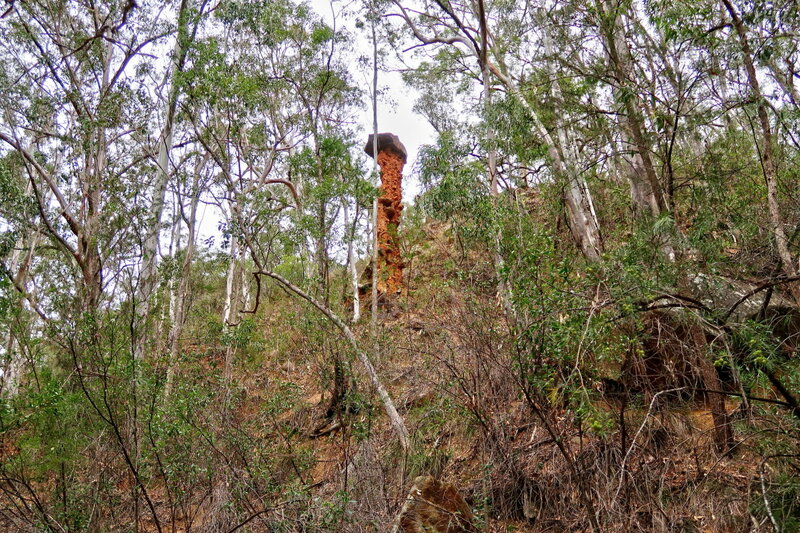 After Annie Rowan Creek, it is bushbashing to The Totem Pole. 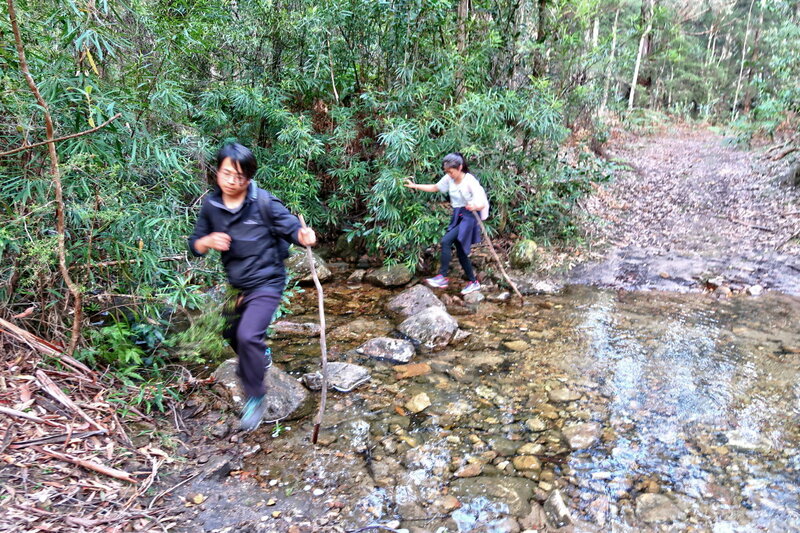 At times we are up to 300 meters from the Wolgan River. 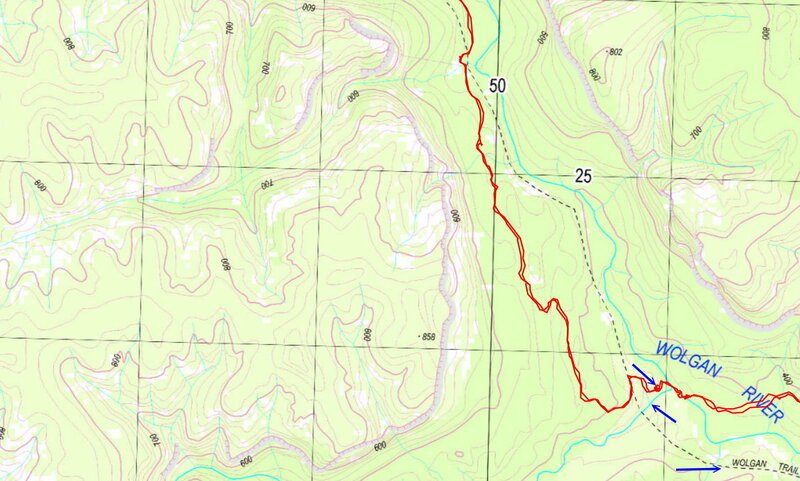 It is not pleasant going as the terrain is tougher, the scrub is denser and the slope is steeper than the pre Annie Rowan Creek section. 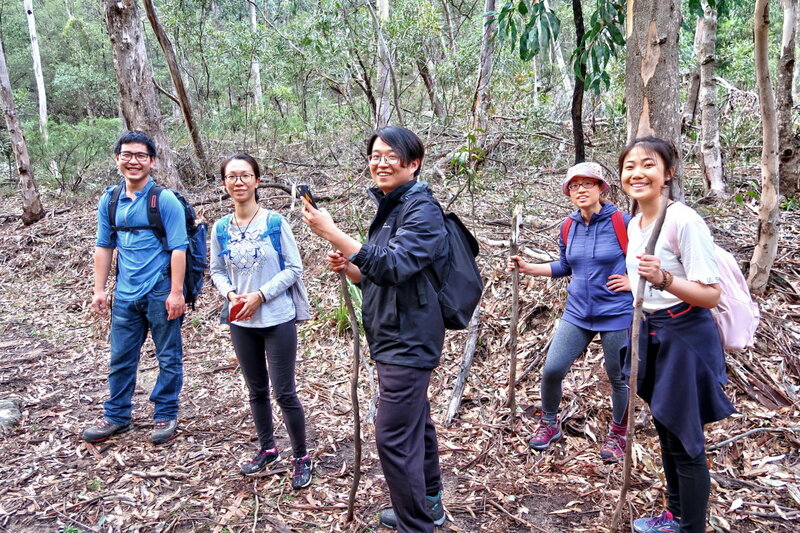 So if you are at this part of the trip, either go even higher up the slope, or simply walk along the bank of Wolgan River as we'll do on the return leg. 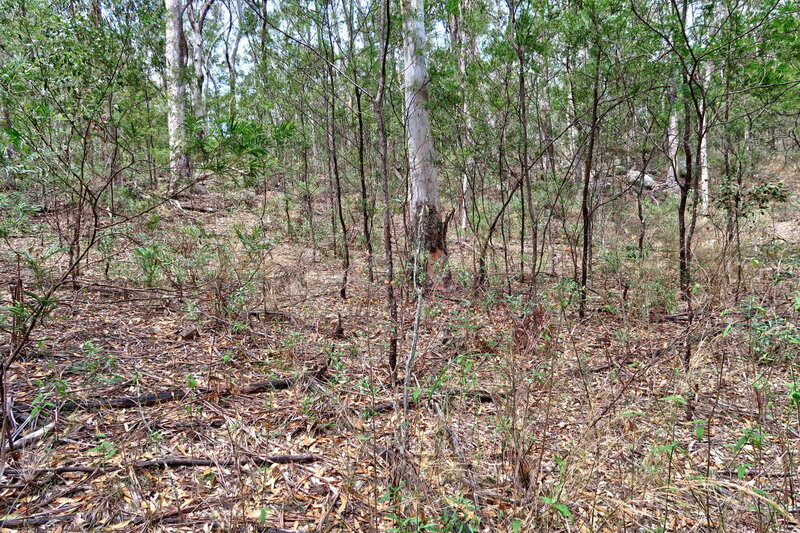 Most of the time, the bush is much denser than here. 31) ... and lo and behold, there it is ! WOW ! What a feeling ... after 9 hours and 25 kilometers ! 32) We'll climb up to the Totem Pole later, but first, a photo session ! Just as well the Totem Pole is not easily accessible. 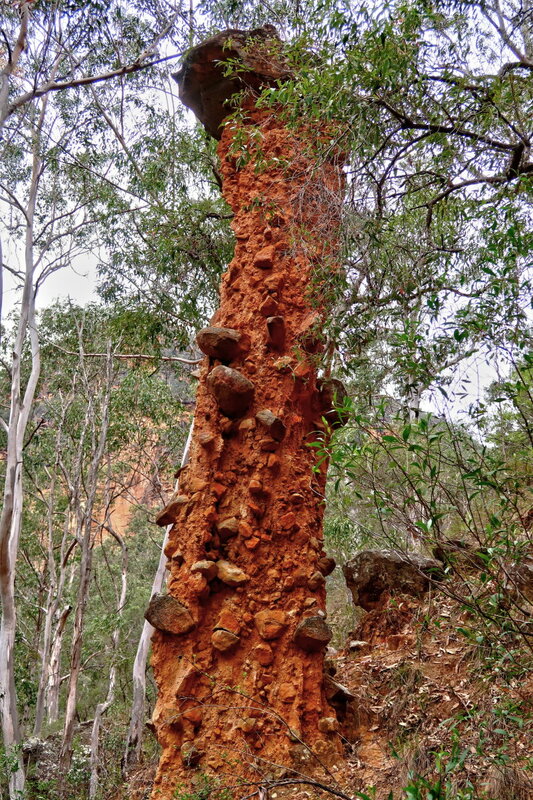 Else all the climbing on the steep slope by visitors would cause enough soil erosion to soon send it tumbling down to the Wolgan River below. 34) Neilson has climbed up to near the base of the Totem Pole. From the pic, you can see that the pole is resting on a steep slope. 35) I am at the Totem Pole. Isn't it a wonderful sculpture by nature ! 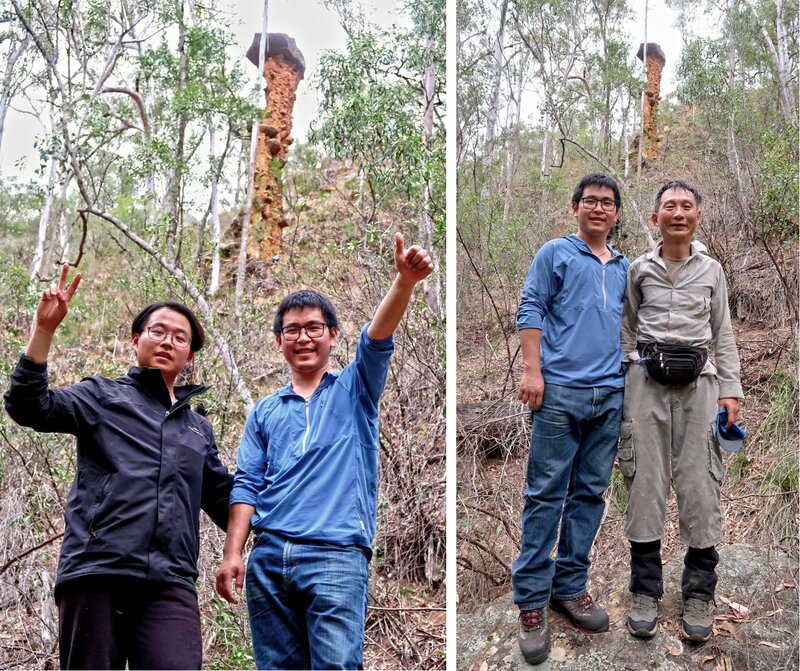 Somehow, the pillar is made of material strongly bound together and resistant to weather erosion ... but how what why and when? It is also protected somewhat by a capstone on its top, but that doesn't explain its continued existence. Standing on a steep slope, it is also gravity-defying. You really have to wonder why it hasn't toppled over already ! 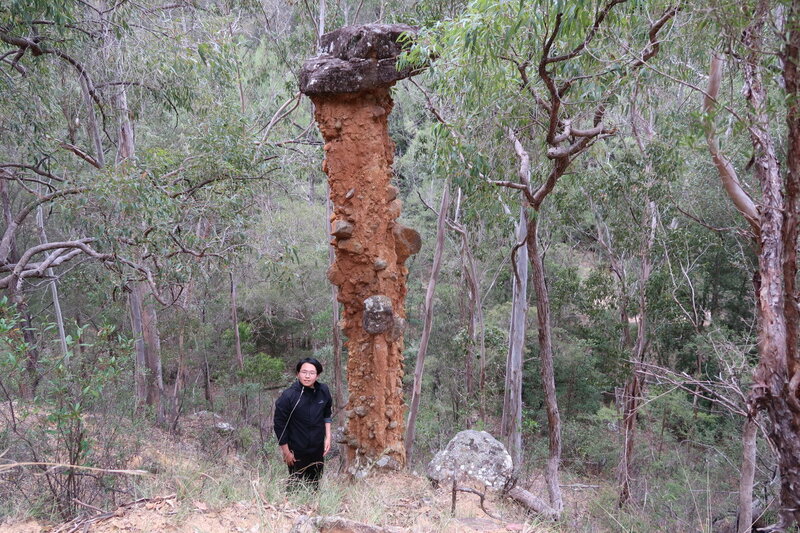 37) The column looks rickety built with a conglomerate of earth and rock. 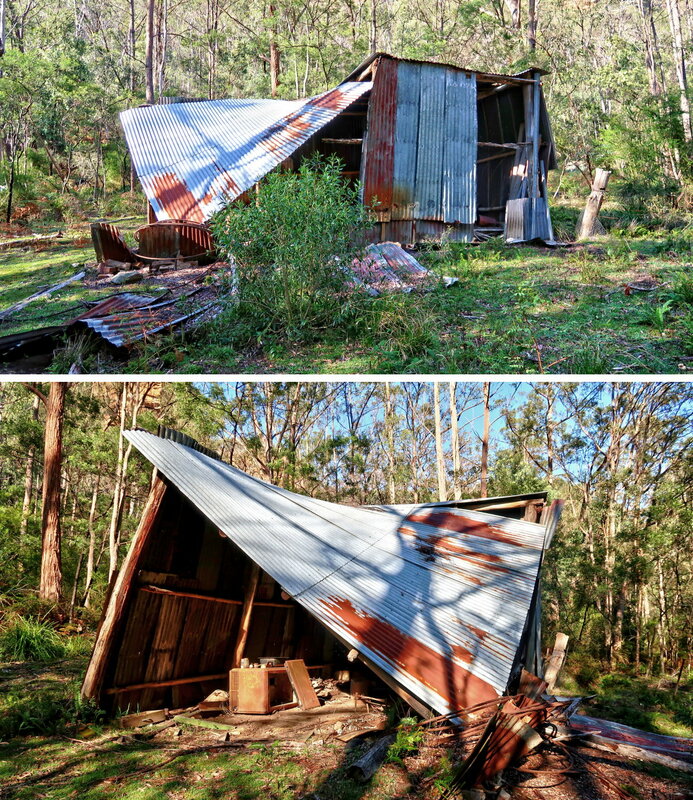 It looks as if it is going to collapse at anytime ! You just have to wonder what binds the earth and rocks together in the column, while the surrounding hillside gradually eroded away ? 38) The capstone - it plays a part in protecting the Totem Pole from being eroded. 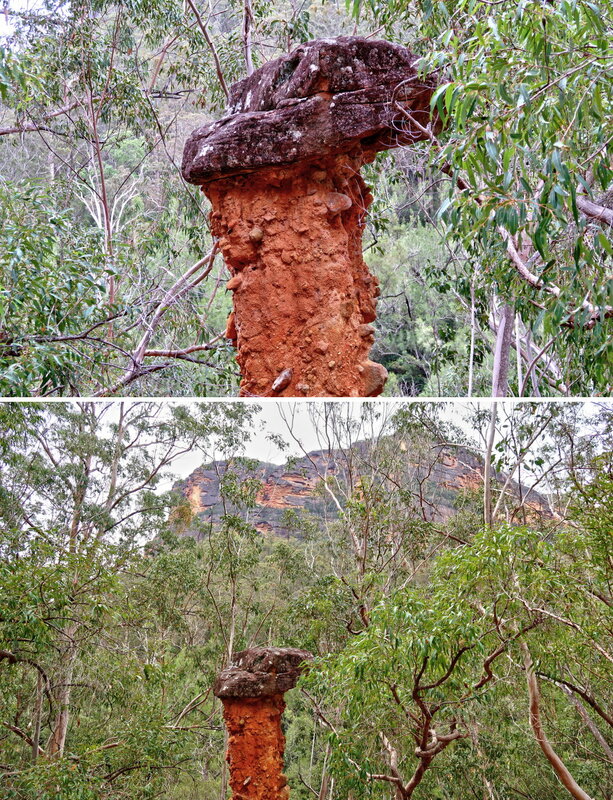 - Lower pic: The mountain in the background is Mt Morgan. Sadly we can't rest our tired legs for too long. It'll be dark soon and have 25 more kilometers to return to the car. On the return leg, instead of retracing our steps by going up the slope, we walk along the river bank instead. Sometimes we are slowed by boulders strewn across the bank. But overall, our progress is faster. So, it is faster to walk along the river bank than walking higher up the slope as we did on the way to the Totem Pole. The other alternative is to walk even higher up the slope (further away from the river). But I don't know whether it will be faster. 41) We are back at Annie Rowan Creek and taking a rest. From Annie Rowan Creek to where we'll cross to the north side of the river, we also keep walking along the river bank. Again, on occasions, we are slowed by boulders strewn across our path. 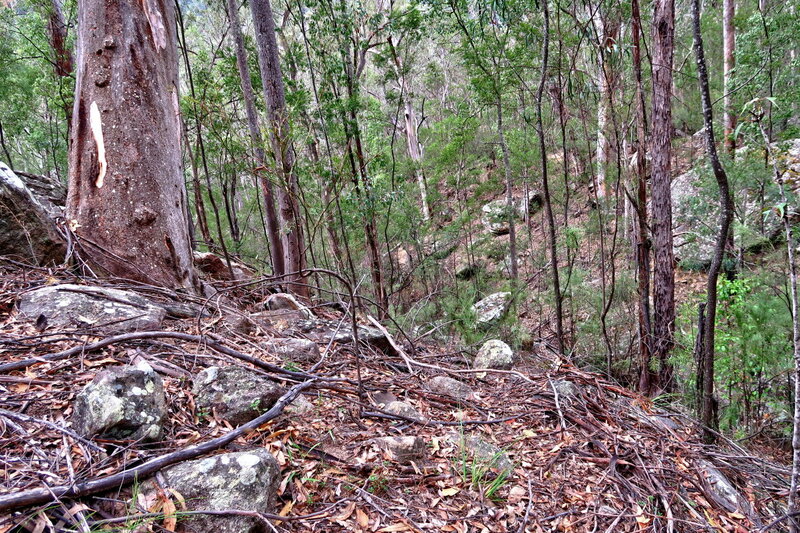 So, along this section, it is faster to walk higher up the slope (on the south side of Wolgan River) than boulder hopping along the river bank. We are fortunate ... just when the sunsets, we are back at the indistinct disused road/track where the walking is much easier. But still, we have another 19 km to cover. And unfortunately, Neilson developed minor injuries on his toes and leg. So we walk a bit slower and take more rests. By the time we are back to the car, it is 3:10 am, all up, a 21-hour day ! I drank about 7.5 litres of water for the trip ! 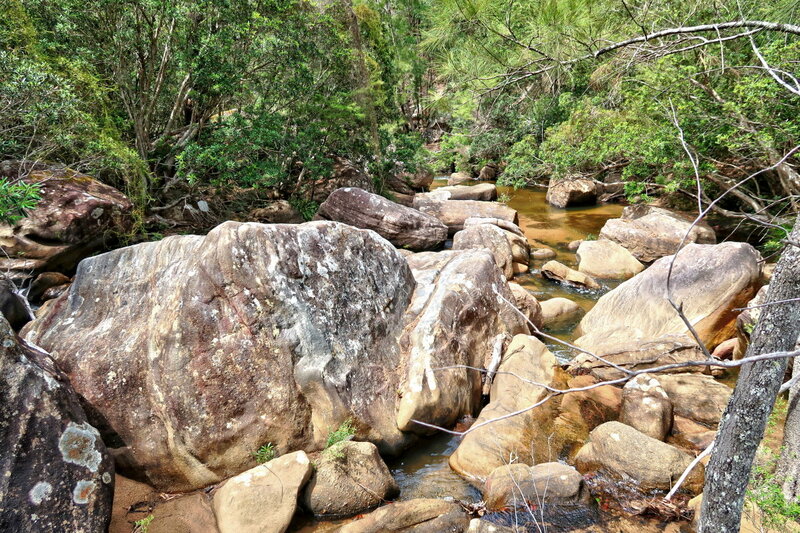 4.5 litres were carried in the backpack at the start of the trip, then top up at Annie Rowan Creek. - Is it worth all the effort to walk 50 kilometers to see the Totem Pole? Four months later in February 2018, I'll go to see the Putangirua Pinnacles, an entire hillside of hoodoos, in the Wellington Region of New Zealand North Island. It is much easier to see the hoodoos there, less than an hour of walk, compare to the ages of walk to reach the Totem Pole. Many thanks to Angela Barton and Peter Medbury for their invaluable advice on the route to the Totem Pole.